Click on the Waving American or Korean Flags to read about it's the symbolism and meaning. Tae Kwon Do is a modern martial art from Korea that is characterized by its fast, high and spinning kicks, Tae Kwon Do has four disciplines: Patterns, Sparring, Self-Defense, Break Test. Testing requirements increase with belt rank. Training also involves practice in Fallng/ Throwing, Weaponry, Self Defense, and Reactive Knife. The way we train makes our workouts a well rounded practice in the skills necessary to make our students the best martial artist they can be. 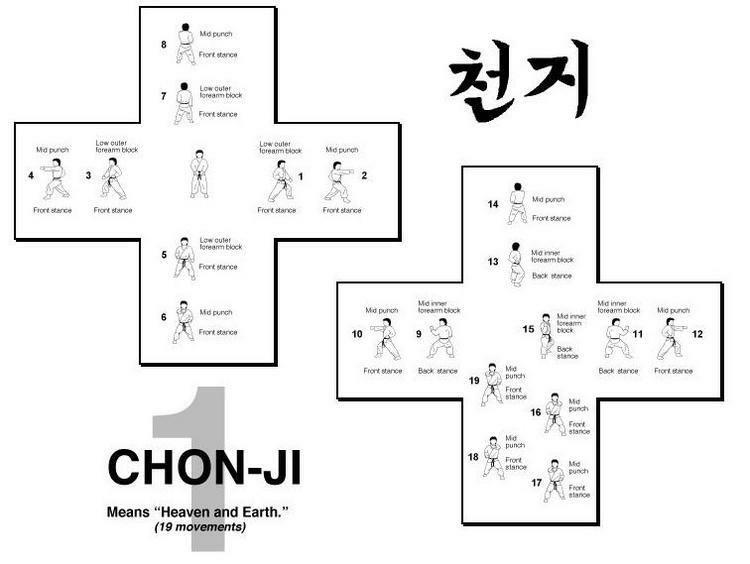 Chon-Ji- (19 movements) Literally Chon-Ji means heaven and earth. It is in the orient interpreted as the creation of the world or the beginning of human history, therefore it is the initial pattern played by the beginner. This pattern consists of two similar parts; one to represent the Heaven and the other the Earth. (WTF) Palgwe Il Jang- Concept of Heaven (Keon) It is symbolic of the beginnings of life, and it is the basic principal of this introductory hyung. 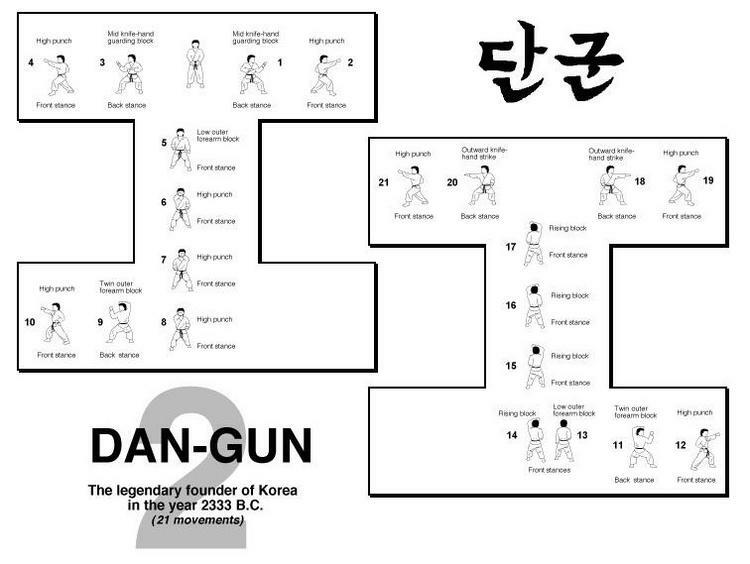 Dan-Gun- (21 movements): Dan-Gun is named after the Holy Dan Gun, the legendary founder of Korea in the year 2333 B.C..
Do-San- (24 movements): Do-San is a pseudonym of the patriot Ahn Chang-Ho (1876 - 1938). The 24 movements represent his entire life, which he devoted to furthering education in Korea and the Korean independence movement. Won-Hyo- (28 movements): Won-Hyo was the noted monk who introduced Buddhism to the Silla Dynasty in the year 686 AD. 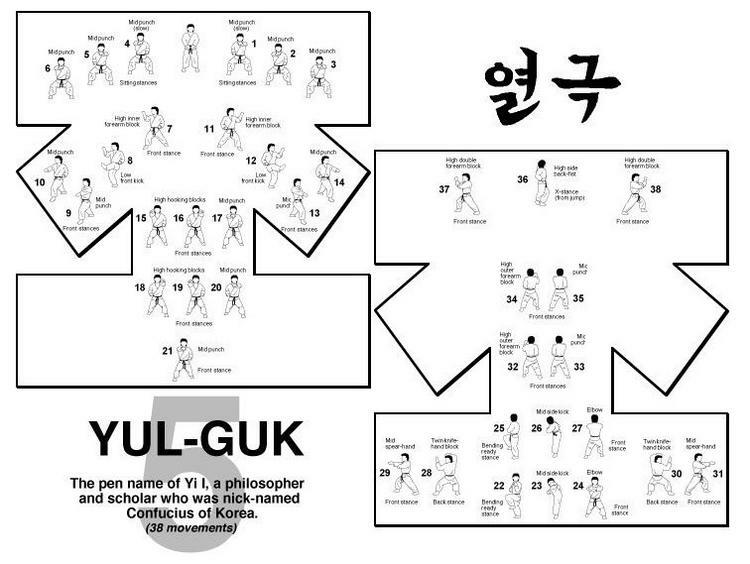 Yul-Gok- (38 movements): Yul-Gok is a pseudonym of a great philosopher and scholar Yi I (1536 - 1584) nicknamed the "Confucius of Korea". The 38 movements of this pattern refer to his birthplace on 38-degree latitude and the diagram of the pattern represents scholar. 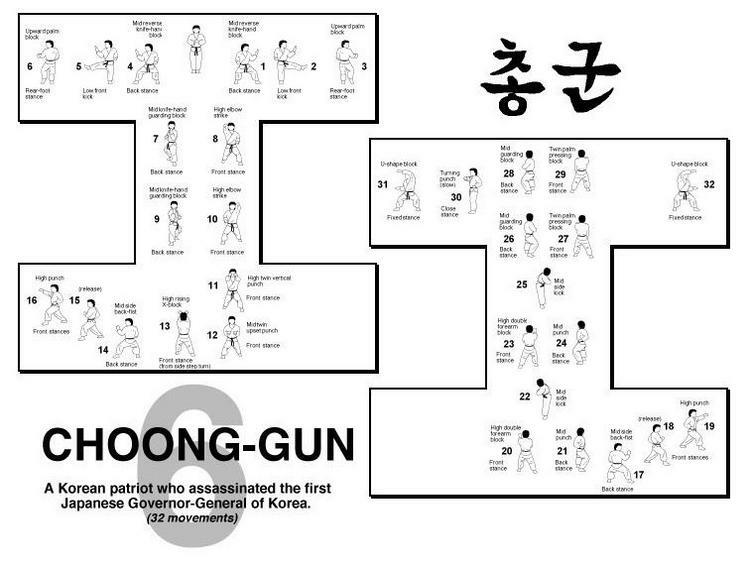 Joon-Gun- (32 movements): Joong-Gun is named after the patriot Ahn Joong-Gun who assassinated Hiro Bumi Ito, the first Japanese governor-general of Korea, known as the man who played the leading part in the Korea-Japan merger. There are 32 movements in this patter to represent Mr Ahn's age when he was executed at Lui-Shung in 1910. (WTF) Palgwe Yuk Jang- Concept of Water (Gam) Water is an element that never loses it's composure, and this leads to it's inherent strength. This hyung teaches the student that they can overcome any problems in life without sacrificing their state of being. Toi-Gye (37 movements): Toi-Gye is the pen name of the noted scholar Yi Hwang (16th century) an authority on neo-Confucianism. The 37 movements of the pattern refer to his birthplace on 37-degree latitude, the diagram represent "scholar". (WTF) Palgwe Chil Jang- Concept of Mountains (San) Mountains are stable bodies, high and majestic in character, but with definite stopping places. This hyung is symbolic of a conservative approach to one's life ambitions and promote the practice of not living in a hasty manner. Hwa-Rang (29 movements): Hwa Rang is named after the Haw Rang youth group which originated in the Silla Dynasty in the early 7th century. 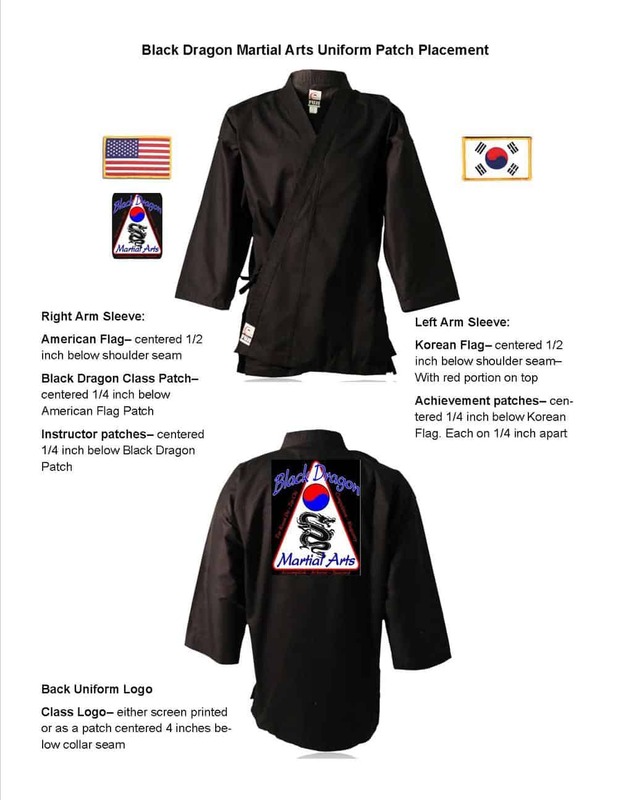 The 29 movements refer to the 29th infantry Division, where Tae Kwon Do developed into maturity. 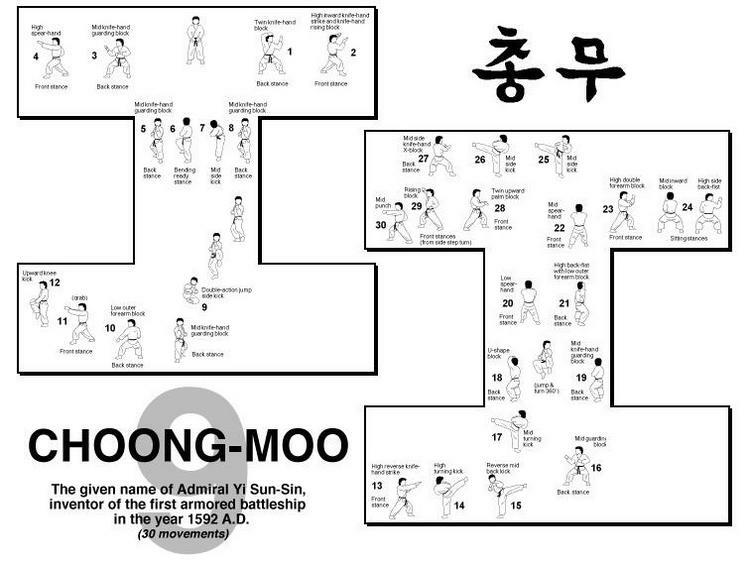 Choong-Moo (30 movements): Choong-Moo was the name given to the great Admiral Yi Soon-Sin of the Yi Dynasty. He was reputed to have invented the first armored battleship (Kobukson) in 1592, which is said to be the precursor of the present day submarine. This pattern ends with a left hand attack, to symbolize his regrettable death. He was noted for his unrestrained loyalty to the King. (WTF) Palgwe Pal Jang- Concept of earth (Gon) This hyung is designed to summarize the seven previous hyung, as well as to introduce several new techniques. At this stage, the practitioner reviews all previous material before making the transition to the black belt level. Kwang-Gae (39 movements): Kwang-Gae is named after the famous Kwang-Gae-Toh-Wang, the 19th king of the Koguryo Dynasty, who regained all the lost territories including the greater part of Manchuria. The diagram represents the expansion and recovery of lost territory. The 39 movements refer to the first two figures of 391 AD, the year he came to the throne. Po-Eun (36 movements): Po-Eun is the pseudonym of a loyal subject Chong-Mong-Chu (1400) who was a famous poet and whose poem "I would not serve a second master though I might be crucified a hundred times" is known to every Korean. He was also a pioneer in the field of physics. The diagram represents his unerring loyalty to the king and country towards the end of the Koryo Dynasty. Gae-Baek (44 Movements): Gae-Baek is named after Gae-Baek, a great general in the Baek-Je Dynasty (660AD). The diagram represents his severe and strict military discipline. Eui-Am (45 Movements): Eui-Am is the pseudonym of Son Byong Hi, leader of the Korean independence movement on March 1, 1919. The 45 movements refer to his age when he changed his name of Dong Hak (oriental Culture) to Chondo Kyo (Heavenly Way Religion) in 1905. The diagram represents his indomitable spirit, displayed while dedicating himself to the prosperity of his nation. 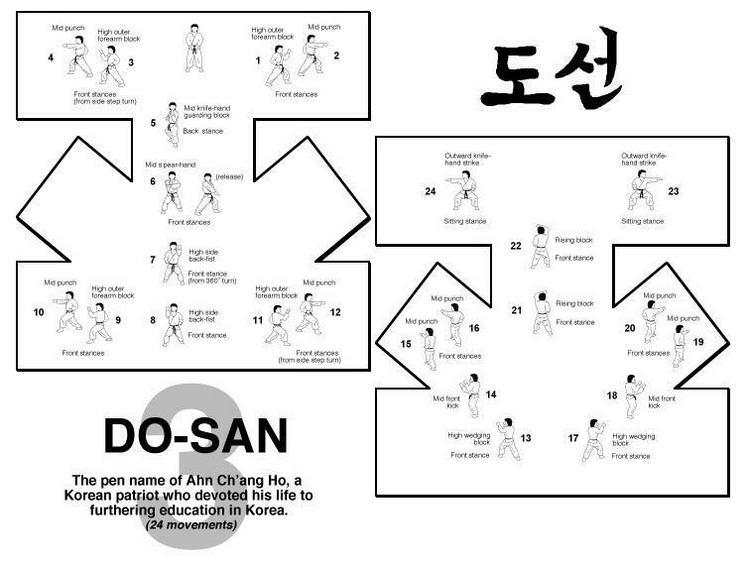 Choong-Jang (52 Movements): Choong-Jang is the pseudonym given to General Kim Duk Ryang who lived during the Yi Dynasty, 14th century. This pattern ends with a left hand attack to symbolize the tragedy of his death at 27 in prison before he was able to reach full maturity. Juche (45 movements) is a philosophical idea that man is the master of everything and decides everything. In otherwords, the idea that man is the master of the world and his own destiny. It is said that this idea was rooted in Baekdu Mountain which symbolizes the spirit of the Korean people. The diagram represents Baekdu Mountain. Sam Il (33 Movements): Sam Il denotes the historical date of the independence movement of Korea, which began throughout the country on march 1, 1919. The 33 movements in the pattern stand for the 33 patriots who planned the movement. 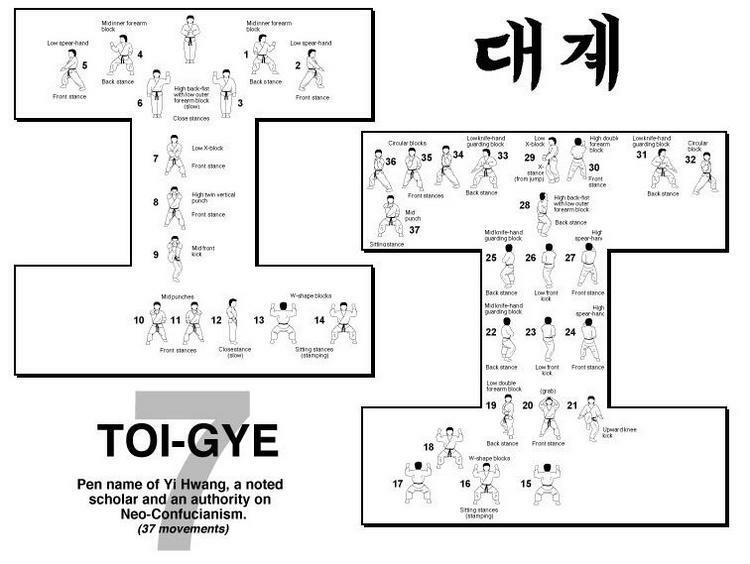 Yoo-Sin (68 Movements): Yoo Sin is named after General Kin Yoo Sin, a commanding general during the Silla Dynasty. The 68 movements refer to the last two figures of 668 AD the year Korea was unified. The ready posture signifies a sword drawn to the right rather than the left side, symbolizing Yoo sin's mistake of following his king's orders to fight with foreign force against his own nation. Choi Yong (46 Movements): Choi Yong is named after General Choi Yong, Premier and Commander-in Chief of the armed forces during the 14th century Koryo Dynasty. Choi Yong was greatly respected for his loyalty, patriotism, and humility. He was executed by subordinate commanders headed by General Yi Sung Gae, who later became the first king of the Yi Dynasty. Yon Gae (49 Movements): Yon Gae is named after a famous general during the Koguryo Dynasty. Yon Gae Somoon. The 49 movements refer to the last two figures of 649 AD the year he forced the Tang Dynasty to quit Korea after destroying nearly 300,000 of their troops at Ansi Sung. UL-JI (42 Movements): UL-JI is named after general UL-JI Moon Dok who successfully defended Korea against a Tang's invasion force of nearly one million soldiers led by Yang Je in 612 AD, Ul-JI employing hit and run guerilla tactics was able to decimate a large percentage of the force. The diagram represents his surname. The 42 movements represent the author's age when he designed the pattern. Moon-Moo (61 Movements): Moon Moo honors the 30th king of the Silla Dynasty. His body was buried near Dae Wang Am (Great King's Rock). According to his will, the body was placed in the sea "Where my soul shall forever defend my land against the Japanese". It is said that the Sok Gul Am (Stone Cave) was built to guard his tomb. The Sok Gul Am is a find example of the culture of the Silla Dynasty. The 61 movements in this pattern symbolize the last two figures of 6612 AS when Moon Moo came to the throne.